I'm an early riser these days, generally up by 5:30 AM and at the gym before seven. That means on Christmas morning at my parents' house in Modesto, I have a few hours to kill before my mom and dad join the party. 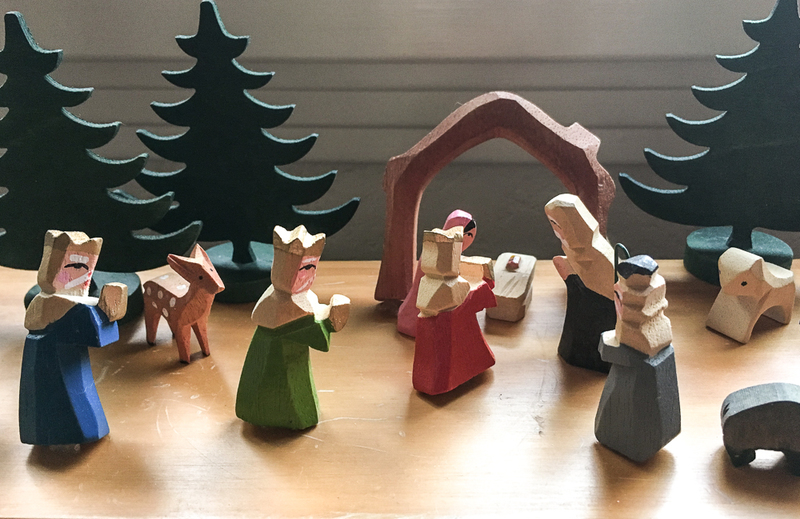 As I was watching the sun come up through the living room window this morning, I noticed the old wooden nativity scene that I loved setting up as a kid. Of all the Christmas decorations we had this one was my favorite and as I got older I would find new and interesting ways of arranging the cast of characters. I used to love digging it out of the storage boxes after Thanksgiving, getting the holiday season started on the right foot. For the first twenty five or so years of my life, the build up to Christmas was my absolute favorite time of the year, a far cry from how I look at it today. You had the songs and the school activities, which I experienced both as a student and a teacher. Then came the two week vacation. As a kid, my cousin and I would listen to music and play board games all afternoon by the Christmas tree. After high school, my friends from Modesto would all be back in town and we'd get together to drink a few beers and rehash the old days. My memories of Christmas pre-retail are mostly wonderful, but that's changed over the last decade. This being my tenth season in the booze game, I have to say that Christmas has become more about sacrifice and survival today rather than anticipation and joy. For us retailers, it's a month long marathon that wears us down to our last nerve until we can finally cross the finish line and collapse, generally left to gather what little energy we still have and use that to power through our one day off until the push to New Year's Eve begins the next morning. During this time of year, you have to work hard to maintain both your Christmas spirit and your composure when you're slogging long hours at the shop and getting an earful from someone who thinks they should be able to call you up on the 23rd and place a 300 bottle order that's needed for pick-up or delivery within the next 45 minutes. Pride and ego are checked at the door once the holidays begin. Our families take a backseat to the party-planning needs of others during December, replaced by the stress and anxiety of last-minute shopping. The loved ones we're thinking about and hoping to spend time with unfortunately have to hear: "Sorry, I can't come home yet because we're slammed," or "I wish I could see you this weekend, but I have to work Saturday and Sunday as well." It's a very, very different experience from the holiday magic I remember from my youth. Nevertheless, you have to put on a brave face, take it one day at a time, and make it through. Like the end of finals week, you celebrate with gusto once January hits and you look back at what you accomplished with a much more optimistic recollection. This 2017 holiday season was the smoothest I can remember in my K&L career, mainly because of how great our current roster is and how prepared we were going in. I definitely wasn't at my sharpest during this year's melee (I made at least three major mistakes that I can count at the moment), but the rest of my colleagues were there to help when needed. Our phone staff, the wing at K&L that bears the heaviest brunt of the hectic holiday, held down the fort. Our sales staff worked through the long lines with indefatigable determination. Our operations guys ploughed through orders, picked tens of thousands of bottles from hundreds of boxes, and steadied the ship throughout the storm. It was truly a collaborative effort and we emerged again with another successful December campaign almost behind us.